At the beginning of my ill fated job as a junior clerk at the Town Hall, I was sent on an induction course to give me an introduction to Local Government activity in the town. We visited a wide range of places, from homes for elderly people, to a unit for disturbed children and to the crematorium. It was, I think, the visits to the first two of these, that contributed to my later training as a psychiatric and general nurse. Two of my most memorable visits were to the town abattoir and to the sewers. The former was to one side of a narrow and twisting road, near the Dust Destructor and nearly opposite the Down’s School, at which I had been a pupil. I won’t go into the details of this visit but I found them fascinating. Some said that they would become vegetarians. It seemed like a reasonable option. The visit to the sewers was my favourite part of the induction course. A hatch in the pavement was opened, near where the buses stopped at the Old Steine. We went down a fairly long and straight ladder, into the heart of the sewers. My first reaction was how clean the whole structure seemed to be. We walked alongside the Intercepting Sewer, that ran underneath of the seafront and to which all other sewers emptied. As is often the case with these things, the Victorian built structures were hugely impressive. It was odd to come out into the daylight and find yourself so near to where the 26 bus stopped and to know that there were all these caverns deep beneath your feet. 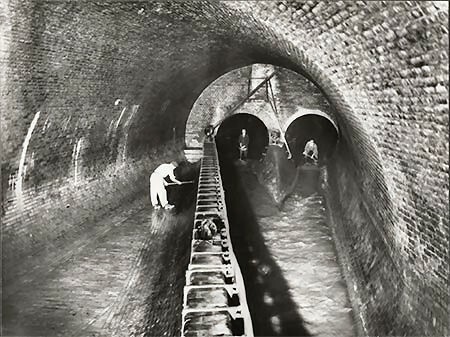 In the 1960’s, as part of a group from Brighton Technical College, I also did a tour of Brighton sewers. We went in though one of the lower promenàde arches, to the west of the Palace Pier. This led into an anteroom where meters showed the rising level of rain water that had fallen during the previous night was now reaching where we were, having flowed through the road drainage system. Àfter that, during the tour of the sewers, we saw part of the original Victorian system that cost (from memory) £100,000.00. We were informed that every single one of the people working in this environment had at some stage had the pleasure of falling into the flow! Finally we emerged from the tour through a manhole cover close to a bus stops in front of the Royal Pavilion, where a çouple of ladies waiting for the bus must have thought we were illegal immigrants entering the çountry. I too went with a class from Brighton technical college in the ’60s and like Alan Phillips entered by the Palace Pier and came out via a manhole near the bus stops near the Royal Pavilion, surprising passers by.